A good choice for consumers who are looking for a gas dryer that won’t break their budgets yet offers ample space for medium to large loads. 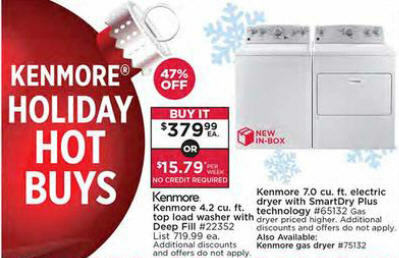 The Kenmore 75132 Gas Dryer takes the guesswork out of drying laundry. With the help of sensors and custom cycles, your clothes are sure to come out dry every single time. 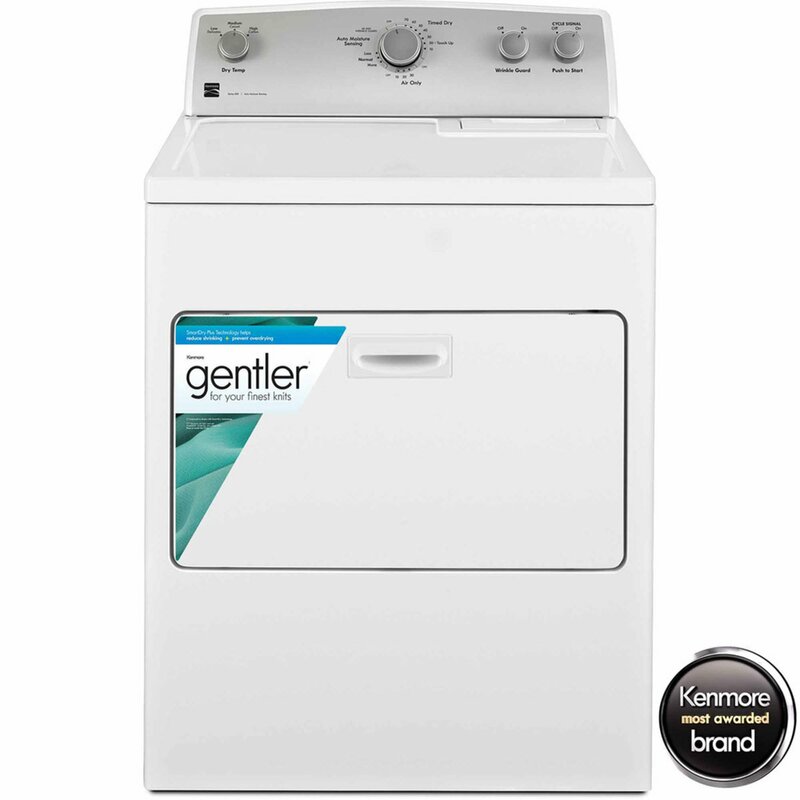 This easy-to-operate gas Kenmore dryer takes a lot of the hassle out of doing laundry so you can actually enjoy your day. This Kenmore 7.0 cu. ft. gas dryer’s extra-large capacity means it can tackle cumbersome loads, like towels and bedding, with ease. No more trekking to the laundromat for a specialty dryer. SmartDry Plus technology uses 2 moisture sensors and a temperature sensor to adjust the dry cycle, ensuring dry clothes each time without damaging fabrics. Wrinkle Guard lets you do laundry on your terms by giving a load a quick toss to prevent set-in wrinkles for up to 150 minutes after the dry cycle so you can run errands or take a nap without needing to iron out the laundry. The Auto Dry feature uses an integrated thermostat to monitor and control drying temperature and moisture. No more heat damage, re-drying, or having to guess how long a load will need in the dryer. This Kenmore dryer has 4 temperature settings and an air dry option. From your lightest delicates to the drippiest towels, this dryer has the right settings for just about any load you toss in. This GAS DRYER requires a 3-prong 110v grounded electrical outlet and a gas supply line with an above floor shut-off valve on the same floor level as the dryer and within 3-feet of the appliance location. 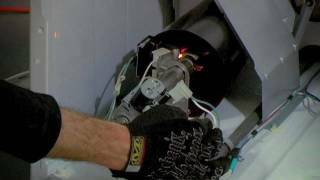 If your home is not equipped with a gas supply line, you may need to purchase an electric dryer. Please confirm that you’ve selected the correct fuel type before completing purchase. Selecting incorrect fuel type can delay delivery. I have had this machine for about two months and I absolutely love it! First off, I need to make it clear, this machine’s first duty is to save space. It is not for more than 1 or 2 people in a household. I can see how a family could use it, but they would have to completely change their way of doing laundry. You would have to do several small loads throughout the day, and use the programmed cycles so it can do its thing while you are at work or during the night. It can be done, this is a very smart machine. You just can’t use it like a regular washer/dryer pair and expect it to get things done as quickly. The cycles are about 3-5 hours as long as you don’t over load and don’t over dry. I take blankets and other very heavy items to the laundromat. It is important to limit loads to not above the lower edge of the window in the door. It is also important not to over-dry the loads. It is true that at first, the items feel “damp.” But they are not wet. The way the machine dries uses condensation, so they may not feel that “hot and dry” feeling like with a tumble dryer. All you need to do is take each item out and shake it smartly a few times and let it get to room temperature. It will feel dry then. If you dry items to the point where they feel “hot” I noticed that items will shrink, even if they were older items that should have done all of the shrinking. This is the reason I did not give it 5 stars – the issue with shrinking clothes when over-drying. There is a learning curve to use this machine, but once you get used to it, its great! My last dryer I went with a more expense LG model that matched the front loader with the clear door to see through, all digital, tons of settings and options and gotta say I HATED that dryer. It didn’t dry a normal size load unless you set it on high for an hour and a half, after just a few yrs the drum in it cracked which I found out was a common problem with that model. I finally got fed up and shopped for a new dryer. After checking locally and the big box stores my husband recommended checking amazon. I had no idea they handled large appliances. I really wanted to find just a regular back to the basics clothes dryer without all the fancy crap that really doesn’t do any good. I grew up with Kenmore appliances in the house and remembered the lasting many yrs with no repairs so when I saw this one I thought I’d try it. The price and size were good. It arrived quickly, delivery was free as well as removal of my old dryer so that was a big plus since other places wanted $60-$80 to do that. The delivery guys were great! Friendly and efficient and careful in my home loading and unloading. I’ve done about 10 loads in it so far, med, large and XL loads and I LOVE this dryer! Even an XL load is done in an hour or less. Its quiet, simple and efficient. I hope I have it for many years! Thanks Kenmore you didn’t disappoint! 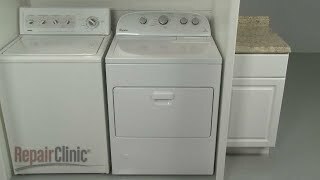 I will be looking to replace my LG washer soon and will look here first! Amazon needs to vet their people better. I will divide this review into two parts. One for Amazon and the physical dryer and the other for the installation which was included in the price. One: The order went smoothly and was delivered by the installer exactly on the date and time I requested on Amazon’s order. The unit runs fine and I give that part of the order 5 stars.Two: The installation, a disaster. They pulled up with the dryer in a beat up 20 foot box truck that looked like it had 200,000 miles on it. Definitely not an Amazon image. Two workmen. Carried the new dryer down into the basement and removed the old one. So far so good. Then the physical installation. These guys were definitely not tradesmen, more like a couple of laborers and a truck. They did not have the parts to do the installation properly. I ended up furnishing the vent hood and an elbow to make the connection. It had to go up and over the foundation which you would think to be standard for a basement installation. They had a vent hood for a drywall wall. They tried to put the elbow on backwards, female to female doesn’t work. 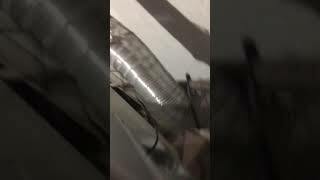 They ended up asking me for duct tape which they used to tape the vent to the vent hood. They did not attach the vent hood to the wall, just left it floating free. I will have to take that apart and install it properly. Then when my wife went to use the dryer, she said that the dryer wobbled, they had not even installed it level. Two diagonal feet too long or two too short so it rocked from three forward feet to three backward feet. That took me five minutes to fix and get the dryer firmly level in both directions. I figure that it will take me thirty minutes to correct the vent, fifteen if my wife will help me. So for the installation portion of the order I give them one star for getting it into the basement. I have to wonder what I would have ended up with had I payed the four dollars more to get it directly from Sears. The cost of the dryer, plus delivery, plus hauling the old one away, plus installation, plus the flexible gas line, plus the vent hood and piping. The main reason I went for Amazon and their one price includes all, no hidden charges, just lousy installation. High efficiency, quiet, convenient and elegant!